Part Number: SD-PEX50064 This PCI Express 2.0 to USB 3.0 and SATA III combo card is convenient for you to have USB 3.0 function and SATA III function with one PCIe card. Chipsets: VLI VL805 & ASMedia 1061PCI Express 2.0 Interface; Backwards Compatible with PCI Express 1.0aCompliant with Universal Serial Bus 3.0 Specification Revision 1.0Provides USB Super-Speed (5Gbps), High Speed (480 Mbps), Full Speed (12 Mbps), and Low Speed (1.5 Mbps)Backward Compatible with USB 2.0Supported Transfer Types:ControlBulkInterruptIsochronusSupports All USB Compliant PeripheralsSupports Bulk Only Transfer (BOT) mode, and USB Attached SCSI Protocol (UASP) modeInternal HDD power connector for Supplying +5V Power to USB PortsCompliant with Serial-ATA Specification 3.0Supports Communication Speeds of 6.0Gbps, 3.0Gbps, 1.5GbpsCompatible with SATA III, SATA II, SATA I Hard Drives and SSDsSupports Gen1M and Gen2m SATA PHYSupports Native Command QueueSupports SATA Port MultiplierSupport SATA Port Hot-PlugIncludes a Hard Drive Activity LED******************************************************************************Note: That The Card MUST be connected to The Power Supply via 4-pin Connector to Function Properly. Connector NOT included. This item is covered by VirVentures Return Policy. Pros: Not many since it didn't work at all w/ my older servers that I was trying to get some USB 3 into. Failed to boot failures in the BIOS. It does work in my ASUS motherboard based server and a Dell T20 server. Other Thoughts: I would recommend trying another product for older servers. We're sorry that you had this experience with our card. In the description it does state what compatible OS you can use with the card. You can also look on our website to see further info. If you needed help resolving any issues you could also reach us at support@sybausa.com . We value your feedback and hope to hear from you soon! Cons: > Difficult to seat USB cables due to vertical orientation of ports, some cases will abut the very edge of the port and require you plug in a cable visually, not by feel. A real problem if your box is on the floor, under your desk or in any other enclosure. > USB 3.0 dropped off in 5 months, down to USB 2.0, and then failed completely. First there were connection errors - the drives dropped out - and then the card just stopped. A reboot may restart the card temporarily. Windows device manager will show the exclamation point with error details. Other Thoughts: Did not use this for SATA III, so I can't comment on that performance. We apologize for the troubles you're having with this card. These cards do have a 3 year warranty if you wanted to replace it. Thank you for your valued feedback on this product. Pros: This item requires the proper drivers downloaded online, not from the included disc. If you let Windows install generic drivers it will be nothing but trouble; but works great with the right drivers. This includes the USB 3.0 ports on the rear as well as the SATA 3 internal ports; very reliable and stable. Cons: The included disc could have the proper drivers for Windows 7-64. A little confusing to find the drivers online, but if you follow the jist of the file names on the included paper, you'll find them OK.
Other Thoughts: I would highly recommend this item if you're able to obtain the proper drivers. I needed both the rear USB 3.0 ports AND the internal SATA 3 ports as well. Has given my system much needed room and flexibility. Cons: I have had nothing but problems with this card. Syba replaced it and I did get the new to work for a very brief time but finally decided to remove it from my computer. I will just give up on it because it costs too much to ship it back and I've put far more time and money into it than it is worth. Other Thoughts: Do not buy this card. I have had Syba products before and was happy with them but this one is a big disappointment. We apologize for your dissatisfaction with this controller card. 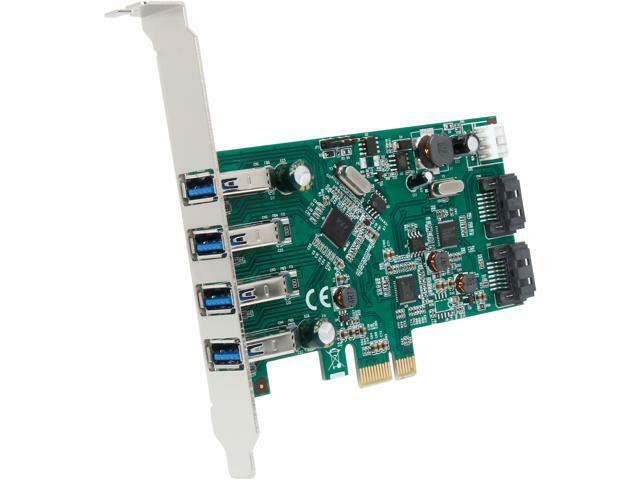 Our tech support team is happy to assist you with any installation or configuration for this card.